Machado Meyer Advogados partner Carlos José Santos da Silva has promised to fiercely defend the interests of CESA associate firms and reinforce the organisation’s presence outside São Paulo and Rio as he begins a second term as president of the influential law firm association. Silva’s inauguration ceremony was held on 27 March in São Paulo. TozziniFreire Advogados’ Moira Huggard-Caine will also serve a second term as vice-president of the Centro de Estudos das Sociedades de Advogados (CESA). Silva and Huggard-Caine were re-elected alongside a new board of directors. Silva told Latin Lawyer CESA will strengthen its branch network across Brazil, defend law firms’ interests and foster debate about the big issues in the legal industry. Since the start of Silva’s first term in 2015, CESA has increased the number of associate law firms by 20% and opened three new regional branches. It now counts 16 regional branches across Brazil. In addition to expanding CESA’s presence, Silva underscored the association’s commitment to defending law firms against government-led efforts to tax their services. He says several city councils recently tried to change local rules that would lead to law firm-targeted taxes hikes – something CESA successfully challenged. “We will continue to be watchful of such attempts and work on behalf of firms in this respect,” he says. 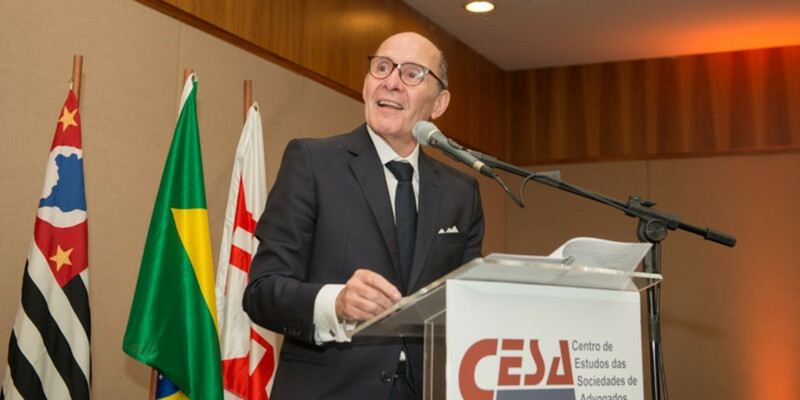 Under Silva’s tenure, CESA will also challenge the practice of consultancy firms, general associations and online companies that offer legal services that only Brazilian law firms can offer under national legislation. During his speech at the ceremony, Silva called these practices “an invasion of the legal profession” that “need to be fought against.” He also said CESA “will never be silent” and will continue denouncing these invasive practices wherever they occur. Silva also underscores the importance of international firms acting in Brazil being compliant with local regulations. “We welcome the presence of international legal firms in the Brazilian market, but we need to make sure they follow our regulations,” he told Latin Lawyer. Meanwhile, CESA will fight any violation of lawyers’ legal protections. “We cannot just watch and do nothing when lawyers have their right to professional secrecy violated and law firms are targets of police raids under generic legal orders,” Silva said in his speech. CESA’s president took special aim at a proposal called the ‘10 measures to fight corruption.’ The bill is supported by prosecutors of the famous Operation Car Wash anti-corruption and has obtained popular backing in recent years. The proposed legislation is now under analysis in Brazil’s Congress. Silva believes the proposal has been disguised as an anti-corruption measure but risks lifting important protections essential for legal activity. Fostering important debates about topics affecting the legal profession will be another of CESA’s tasks, says Silva. The use of artificial intelligence by law firms has been an especially hot topic and was the sole theme of CESA’s latest annual publication. The association is also developing a diversity project designed to facilitate the hire of black lawyers by law firms. The project is supported by some of Brazil’s elite firms including Machado Meyer Advogados; Trench; Rossi e Watanabe Advogados; Mattos Filho, Veiga Filho, Marrey Jr e Quiroga Advogados; Pinheiro Neto Advogados; TozziniFreire Advogados; Demarest Advogados; Lefosse Advogados; and Sergio Bermudes Advogados. Silva’s signing ceremony was well attended. During the event, Justice Minister Torquato Jardim delivered a keynote lecture to more than 400 people who included prominent members of the legal community as well as government officials and legislators.